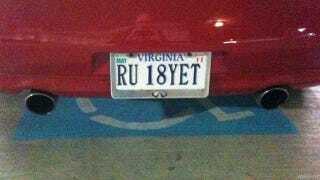 No, it's not a Photoshop, this Virginia plate reading "RU 18YET" is real. We checked. You can thank the Virginia DMV for allowing this license plate to stay on the road. Ironically, Virginia is abnormally strict about what custom license plates it approves. Famously, the VA DMV revoked the world's greatest license plate: "EAT THE" on the state's "KIDS FIRST" vanity plate. The owner struggled to get the plate re-approved and failed, only to watch as the DMV condone beating children and then approved a facsimile of the plate to someone else. So the Virginia DMV didn't get the humor of "Eat the kids first," but they are fine with "RU 18YET" on a red sports car? I fail to see the logic here. This picture comes to us from a tweet March of 2011, but when we checked this afternoon, the VA DMV told us the plate is still registered. You can check for yourself right here. That doesn't necessarily mean some guy (or lady) is driving around with the plate on this Infiniti, but it does mean it is still in private hands. It could be in the owner's garage, or on the mantelpiece for all we know. Just that fact that the plate is real is creepy unless it's some sort of elaborate, self-aware joke about red Infiniti G-Coupe owners. Virginia Department of Motor Vehicles, please explain to us why this plate isn't prurient but a Swiftian joke is?